The Advanced AJAX Cart extension effectively removes those annoying page reloads that frequently occur when users click “add to cart” and “delete from cart” options. Instead of reloading, items are added instantly with appealing animation effects. 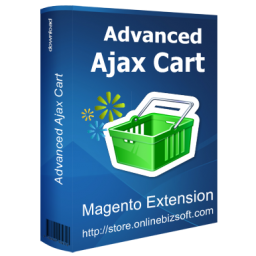 The Advanced AJAX Cart Magento module allows customers to effortlessly add and remove products from their shopping cart without having to continuously click the “update” button. 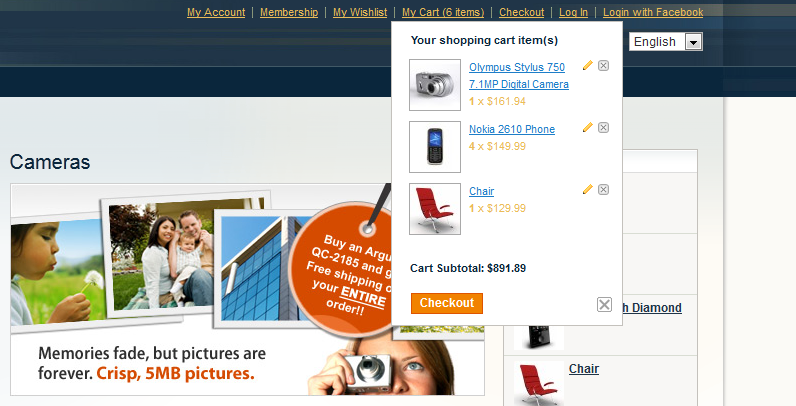 With each addition or deletion, only the shopping cart is refreshed. 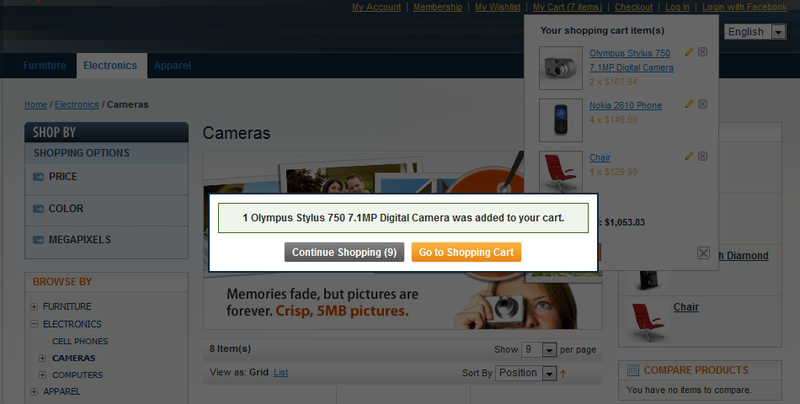 This immediate interaction allows users to continue shopping without waiting for pages to refresh. 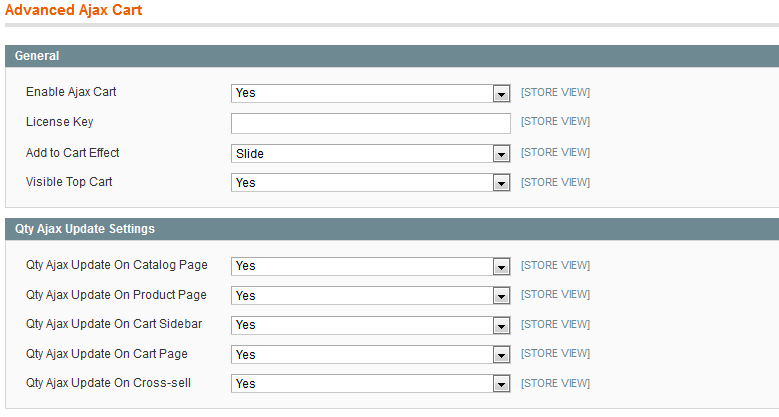 Best of all, it also works on the shopping cart page, enabling deletions and additions without page reloads. With the Advanced AJAX Cart extension, when any native Magento product type is added to cart from the category page, your consumers are not redirected to the product page – they are offered to select item's options exactly from the pop-up confirmation dialog. I had problems with the installation. OnlineBiz team provide excellent support even though it was eventually determined that the problem was in the template. Once again thank OnlineBiz team for excellent customer support. This module is a must-have ! I rate this extension full. This is what I was looking for add to cart. Support was good and working superb. Saving time! This module makes life for the customer very convenient. When on the product page, he can buy the product without having to leave the page. He can continue to read the details, or add related products to the cart. Recommended for any store. I had a conflict between ajaxcart and another extension and the support has did a great job to fix this problem. All the fixes were corrected by Technical Support team and we are really happy with their customer service. Very good extension and good support !!! After installation, this extension had some confilicts with other extensions in our store, but OnlineBiz support was great, they have solved all problems very quickly. Thank OnlineBiz for your service. I got some problems installing at first but OnlineBiz help us sorted it out with in 24 hours. The extension boosts my sales a lot when it brings convenience for customers in shopping process. I must say it's a very useful extension I'm looking for. I like your supports, too. Makes shopping easier and comfort. This module makes shopping for your customers easier and more intuitive. It works great and install easily. Very helpful for our customers. Much faster for those customers ordering more than one product because they don't always have to go to the shopping cart page until they are actually finished. I got some problems installing at first but OnlineBiz help us sorted it out with in 24 hours. Easy installation and setup, excellent support. 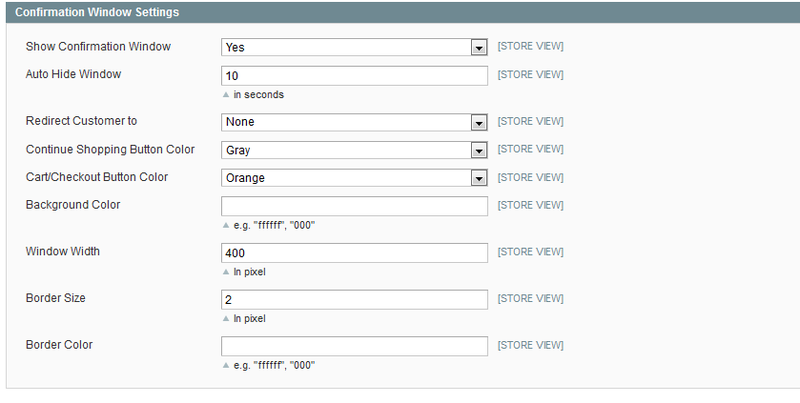 Very useful module, now our customers can quickly add product to cart without waiting reload the web page . It works great and install easily within 10 minutes. I would feel comfortable purchasing any extensions that you develop, as well as recommend you. Excellent customer service, I wanted the quantity fiels to display in product list for my site and allow customers enter quantity for cart, which out of the free support scope. However, OnlineBiz were very quick to offer help and get it working.